According to the president, Jeff Sessions is not the Attorney General of the United States. But he keeps showing up to work and doing something. On Tuesday, he held a much-anticipated meeting with state attorneys general to discuss “political bias” on tech platforms. The transparent move to please his boss didn’t go as expected. 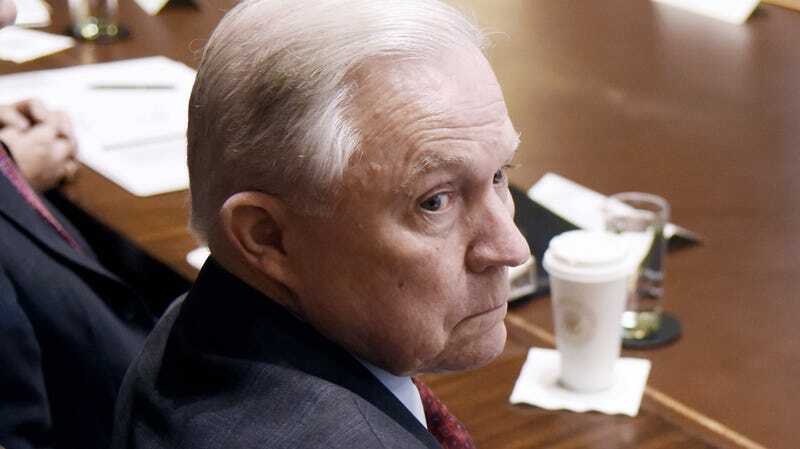 Sessions has been on the outs with President Trump since he took office last year. Trump isn’t happy with the AG’s decision to recuse himself from the investigation into Russian interference in the 2016 election, and few expect Sessions to survive in office after the midterm elections. But today’s meeting promised an opportunity to hand Trump some sort of progress in his war against tech. While politicians and regulators around the world are weighing how to address the issues of privacy, influence, and monopolistic practices that companies like Google, Apple, Facebook, and Twitter have thrust into the world, Trump claims that the real problem is they’re all too mean to Republicans. Attorney General Jeff Sessions opened the meeting by raising questions of possible ideological bias among the tech companies and sought to bring the conversation back to that topic at least twice more, according to D.C. Attorney General Karl A. Racine. But the discussion proved far more wide-ranging, as attorneys general from eight states and the District — and officials from five others — steered the conversation toward the privacy practices of Silicon Valley. Those in the meeting did not zero in on specific business tactics, but they did cover such issues as how companies collect user data and what they do with it once the information is in their hands. The difficulty in keeping all of these lawyers on the topic of social media companies having a bias against conservative views in their moderation practices appears to be rooted in the fact that it’s not really any of their business. Private companies are protected under the First Amendment, and they could theoretically declare their platforms to be no-go zones for conservative speech tomorrow. But they can’t use their business to create an anti-competitive environment in which no one could build a successful conservative alternative. We could, someday, see laws that require giant platforms to treat all speech as neutral, but no such laws exist, at the moment. It’s not the case that every privacy and competition issue would fall under the state’s purview but multiple state-level legal cases could snowball. “This could be a HUGE deal,” Matt Stoller, a fellow at the Open Markets Institute, tweeted. “The Microsoft case started as a multi-state inquiry at a state level, then moved to a DOJ case to break up the giant.” Indeed, the state AGs cited Microsoft’s monumental antitrust case from 2001 as one of three models they’re looking at when considering cooperating in legal action against the tech world. Ill-advised legal action or overreach could have unexpected blowback. The terrible copyright reform making its way through European Parliament is a great example of how to totally screw up a regulatory approach to tech. The good news from this meeting is that the people in government who aren’t reporting directly to the president realize what their jobs are and apparently plan to do them.